A set of 18 pcs (3 Size x 6Pc Each) Food Bag Clip. The sealing clip is great for keeping leftovers completely sealed, or for sealing food packs, cereal pack etc Easy to use & reusable. 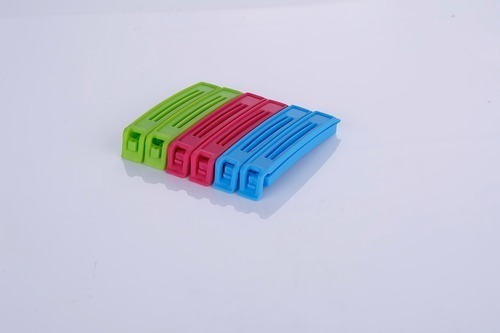 Seal Bag Clip is suitable for clipping different kinds of plastic bags, milk powder bags, food bags, paper bags and so on. Material: Food Grade Plastic. Contains:- 18 Food Bag Clips. Our remarkable collection of kitchen products has been particularly designed to ensure that it effectively uses the available space. Highly convenient to use, our kitchen tools & products have become an integral part of almost every kitchen. "Aesha" products is the name to be reckoned with top companies that are into the business of manufacturing, supplying, trading and distribution of kitchen tools and kitchenware products. these products are designed after acquiring deep knowledge of the market trends. We develop various kitchenware by using top quality hygienic. This ensures that all our products adhere to the international quality standards. Further, this has assisted us in satisfying a large number of customers. In fact, we are the leader in the domain of kitchen products.